Now that you’ve had plenty of time to practice the bottom crust, let’s move upwards. Line pie plate as previously instructed but do not crimp edges. Trim dough about an inch all around. Refrigerate while you prepare filling. Make filling and spoon into pie. Roll out top crust and drape it over rolling pin. Position carefully over filling and unfurl. Now don’t dawdle; it’s important to keep the crust cold while you’re doing all this. Admire your handiwork later. Trim top crust about the same size as lower crust and then, folding, tuck upper layer of crust under bottom to create a ridge. 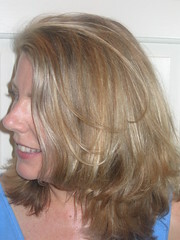 Using thumb and forefinger, crimp all around the edge. With a sharp knife, cut several steam vents into top of pie. Strive to be decorative. 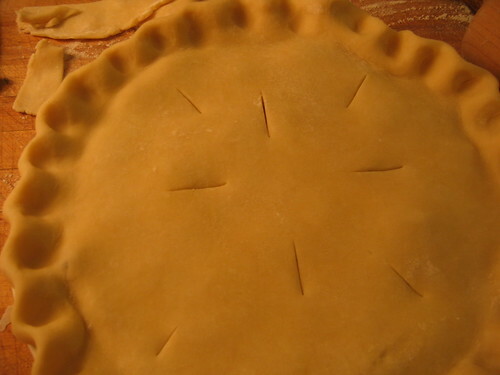 Brush milk gently over entire surface of crust, poking pastry brush into crimped indentations. This will ensure you have a lovely golden crust. Holding a spoonful of sugar several inches overhead, lightly sprinkle entire surface with sugar. Make sure oven is preheated ahead of time. Position your rack in the middle or lower third of the oven. I try to remember to put the pie on top of a baking sheet in order to avoid bubbling, burning messes, but sometimes I forget. Unless you like a houseful of smoke, I suggest you try to remember. Now, go forth and bake pies! Thanksgiving – the veritable Pie-Palooza of holidays – is rounding the bend. The Queen expects A Full Report of your successful pie production. 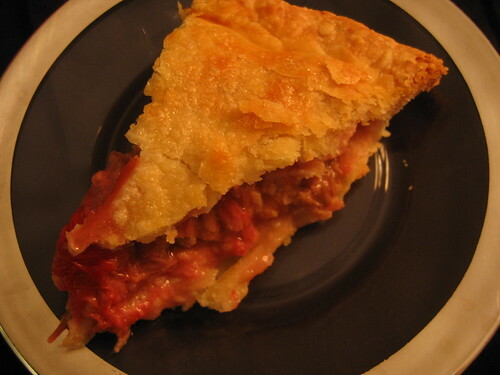 The first time I ate a rhubarb pie was at my friend David’s house in Barrington, Illinois. We had just finished our spring semester at college and had pushed the Fiat hard to get away from Minnesota. I was exhausted from a night of No-Doz and a battle with my Smith-Corona, as I’d typed my final paper for a literature class called Devious Domesticity. David’s mother Coral greeted us with hugs. We stretched our legs as we ambled through her fragrant garden, Coral pointing out the different flowers and vegetables. We went inside where Coral showed us the beautiful braided rugs she was making from old clothes and bundles of rags. 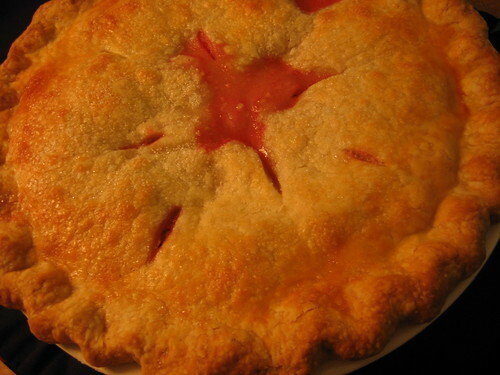 Finally, we slumped into chairs at the kitchen table and let Coral serve us fat slices of still-warm rhubarb pie. In between bites I looked around: the whole house glowed with late afternoon sun, the luster of polish, and an unmistakable air of welcome. Domesticity, dear readers, had never seemed less devious. Mix all filling ingredients together and heap into an uncooked pie shell. Cover with top crust, brush with milk, sprinkle with sugar. Bake at 425 for 15 minutes; reduce heat to 350 and bake 40 minutes more, or until bubbly. 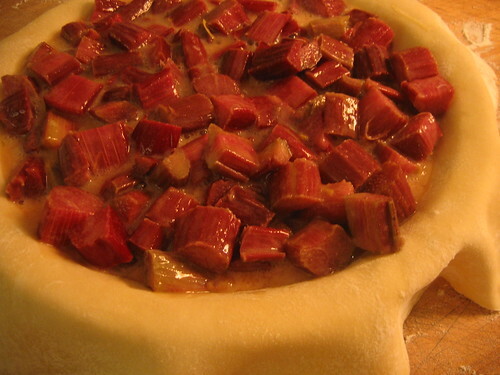 O.K., rhubarb pie is way up there on my favorite food list, and this recipe looks like it could be achievable at my skill level. I also am thinking of trying the home grown crust, possible done with the help of a couple of small children I have around the house. They generally have a pretty good time with this type of project. But I am the world's third or fourth laziest human being. How many points do I lose for trying the rhubarb pie with a store-bought crust, before committing to the effort of the real deal? Doug, the Queen has, in the past, graciously granted me royal dispensation in the area of homemade pie crustery. Although I am not proud of the fact that I used storebought pie crust for the French Silk pie recipe found on Her Majesty's blog, I speaketh the truth. Eth. And if I might be indulged a signature Sir Markb stupid question, is a rolling pin absolutely necessary for making pie crust? Can a large glass substitute for a rolling pin, at least until I try making a crust and deciding whether I would do it more than once? Thanks, Sir Markb. But, uh, isn't a new hardwood rolling pin about four bucks? Is it possible that Sir Markb is even cheaper than Doug, the Noob? 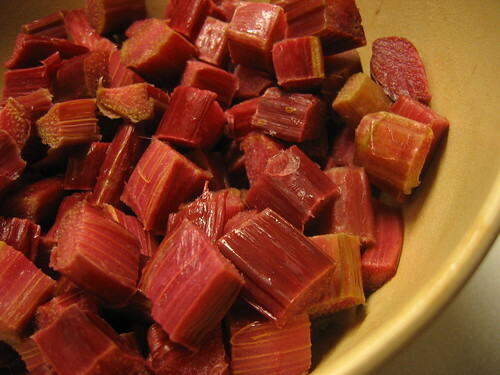 If I found a ziploc bag of cut-up stuff in the back of my freezer, I would not assume it was rhubarb... or even edible. You must have better freezer discipline than I.
Doug, you think I achieved nobility status by spending frivilously on rolling pins, pie tins, and food and clothing for the kids? My real concern is that, as the staff at Stately Markb Manor already has trouble trying to contain the clutter, adding an unnecessary, and large, kitchen utensil won't help the orderliness cause. Especially if it ends up unused. Princely Sum, Tell Coral to kick up her heels and celebrate! 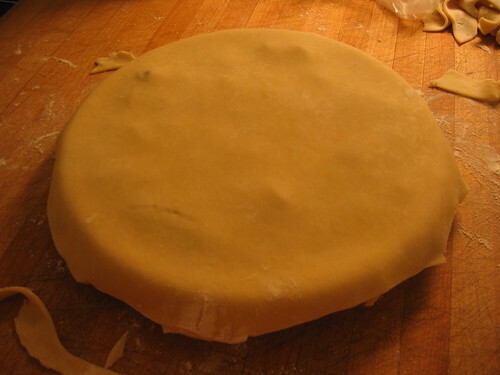 Doug, Might I remind you that the title of this week's post (and last week's too) is "A Pie Crust Primer"? Ahem. Perhaps you should simply consider aquiring a Bebop-a-reebop Rhubarb Pie . . .
Sirmarkb, An empty wine bottle will suffice. Of course, you first have to drink the wine. Such are the sacrifices we piemakers make. Currydude, Our freezer disclipline consists of keeping the Frosty Paws Pooch Treats out of the same box as the Good Humor Variety Pack. How ‘bout a Little Java With Your Joe?